April 13, 2019 marks a century to the world’s most barbarous terror attack ever by the state of Britain on the day of Vaisakhi. Vaisakhi or Baisakhi has been a centuries old popular annual festival celebrated by all the Punjabis with great enthusiasm and get together. 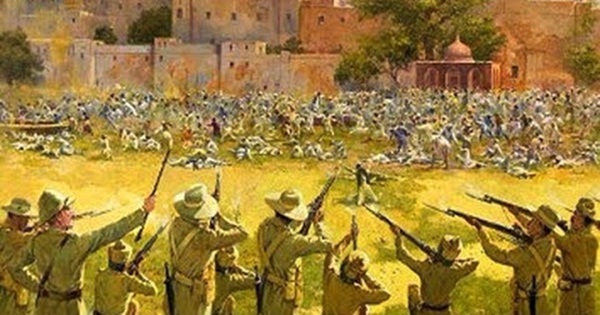 Undoubtedly, this terror attack at the Jallianwala Bagh, Amritsar is one of the worst ever and one of its first kind – UK/ Britain sponsored criminal terror attack. What happened on the dreadful day of April 13, 1919 is known to everyone in bits and pieces and only a few from the new generation are aware of exactly what happened and what was the cause of such an inhumane act of terror by the self proclaimed civilized royals of the UK. The degree of civilization of this pseudo-royalty is evident from the past beastly actions of this state while it invaded the world’s most tolerant country of Bharat (now India, Pakistan and Bangladesh) and this attack which was deliberate, well planned and criminally motivated that took numerous innocent lives, showcases the extreme of this beastly royalty. When the hypocrisy of the UK was exposed with this heinous crime, General Dyer was held solely responsible for the entire cowardly ferocious attack by the UK tyrants then. On the pretext of increasing trade and commercial activities with South East Asia, the East India Company was established by UK in Bharat (now India). The East India Company was masked with open exploitative trade and commerce practices because underneath was the real face of the terrorist organisation being operated secretively by the Britain. While the smaller acts of crime and terror through this terror outfit ‘East India Company’ were already prevalent in most parts of the Bharat, the Jallianwala Bagh attack was the largest and most ruthless – where thousands of bullets were rained at the unarmed innocents including a 5 week old infant to a 90 year old woman, making the park an ocean of blood. Men, women and children from all walks of faith and religion had gathered as usual at the Bagh to celebrate the annual Baisakhi Day but little did they know that their celebration would turn into a bloodbath. The innocent unarmed civilians were brutally killed with the showers of bullets by the British armed troops. Upon watching an army of aggressive British men approaching the park and showering bullets and using force upon women, many women jumped off into the well of water in the park to save their honour and esteem escaping the force of the British men. The bodies of men, old, children, infants all were brutally pierced with bullet shots – that are still evident on the walls of Jallianwala Bagh. It has been hundred years now but Baisakhi has never been celebrated with the same enthusiasm and spirit as it was before the attack. Punjabis have to live forever with the fact that every year the celebrations of Baisakhi come with the grief-stricken remembrance of the monstrous attack by the British. Salute to the degree of tolerance of the Bhartiyas. While tolerance is in the DNA and soul of Bharat which has tolerated the beastly invasions of Muslim terrorists invading in the past too, can India still afford to keep up the beasts brushing aside it. The East India Company has transformed into the modern day’s terrorist groups which are still being funded by some of the Western States. Everyone knows that Britons, to date, are trying hard to manipulate this terror event to change their image grounded upon terrorism. Some try to manipulate the history by calling it a tragedy however other propagandists have a complete new made-up and pseudo-history to alienate their terror tagged shameful history. Explanations and conspiracy theories with concocted and fabricated historic records that support and defend the attack or try to mould this act of terror into a tragedy are unconscionable. The ‘Khooni Baisakhi’ of 1919 has made each Baisakhi celebration thereafter gloomy. Although the Bharatis may have forgiven the assailants, the history and festive spirit can never forgive them. Indeed, this attack by British is a shame in the world history! What happened was not a mere tragedy but a well planned terror attack. The day witnessed a scene that brings goose bumps to anyone who gets to know the truth and the hard reality – a reality where innocence got brutally crushed by the barbarous act of the insane. Truth is light in itself – hence, no one can wash it away. The truth remains as hard i.e. the warm hearted, greatly tolerant, courageous countrymen of Bharat shed their divine blood on the divine land of Bharat, sacrificing their lives – making Jallianwala Bagh no less a place of worship where the true heroes’ embraced eternity through their unforgettable courage and tolerance. Anandi is an avid traveler, traveling to places to explore and learn facts about history and culture. Her writeups are based on her travel. Pulwama Terror Attack – Hit Back Hard Even If It Means War: GD Bakshi Forgotten 1st Attack on Sabarimala; 2nd Attack Reminds Danger to Hindu Culture 1824 Gurjar British War at Koonja; How Hundreds Were Hung by British in Single Tree India should Crack Down upon Terror Sympathizers within the Country Atrocities on Indian Women and India by British During Their Rule Is Modi’s Call to ‘Avenge Terror’ the Last Nail on ‘Gandhian Ahimsa’?